The scheme above starts with a square geometry for the cyclobutadiene. This is strongly anti-aromatic, and the molecule will strive to reduce this by indulging in a geometrical distortion. 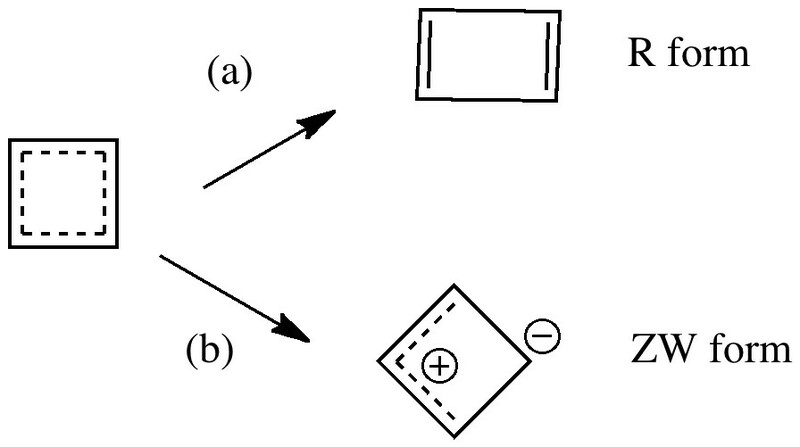 The conventional distortive mechanism is into an R or rectangular geometry, where two of the C-C bonds get shorter and two longer. The trouble with this mode is that is does not actually prevent the π-π overlaps which made it anti-aromatic in the first place, it just reduces the effect. Thus rectangular cyclobutadiene is still a very very reactive and unstable molecule. So here I suggest another distortion mode, shown above as the ZW, or zwitterionic form. This converts the species into a combination of an allylic carbocation and a secondary carbanion. The latter would be expected to pyramidalize, thus reducing those pesky π-π overlaps. I am unaware of such a ZW-mode ever having been previously explored. Any student of organic chemistry will be very familiar with how to go about stabilising either a carbocation or a carbanion. We need to do this, since another guiding tenet of organic chemistry is to try to avoid charge separation whenever possible (another almost no-go area). I am going to pull a surprise by evaluating the following model for this post. Firstly, two methyl groups have been placed at the carbocationic centres to stabilise the positive charge. Tertiary carbocations are of course well known to be more stable than secondary ones (I should state that methoxy groups in the same position would stabilise even more, but that is for another post). The carbanion could itself be stabilised with an electron withdrawing substituent (say CN) but here I am going to stabilise it with hydrogen bonding to a guanidinium cation. 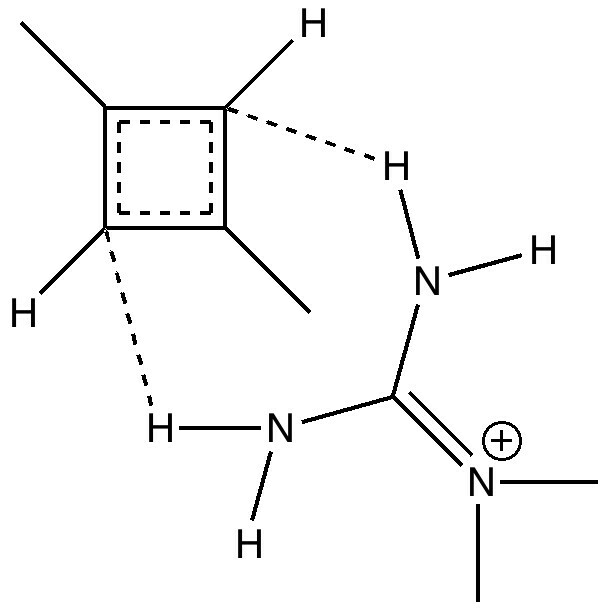 This has just the right shape to form two unusual hydrogen bonds from the N-H to either of the carbanionic lone pairs we might wish to promote (dashed lines above). Finally, we are going to simulate this in water as a solvent, in order to stabilize the zwitterion. 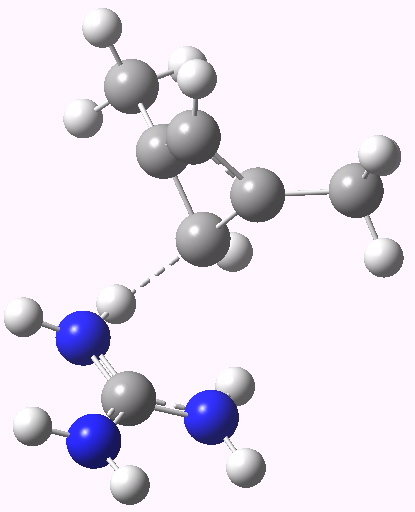 One zwitterion that DOES form is of course that from the amino acid glycine, but it only forms when placed in water (and life as we know it would not be possible if amino acids did not do this). The results are thus. The R distorted form does come out the most stable (ωB97XD/6-311G(d,p)/SCRF=water). An unsymmetrical ZW form (forming just one C…H-N hydrogen bond) is 11.2 kcal/mol higher in free energy, whilst a symmetrical form (as shown above, forming two C…H-N hydrogen bonds) is only 8.5 kcal/mol higher in free energy. 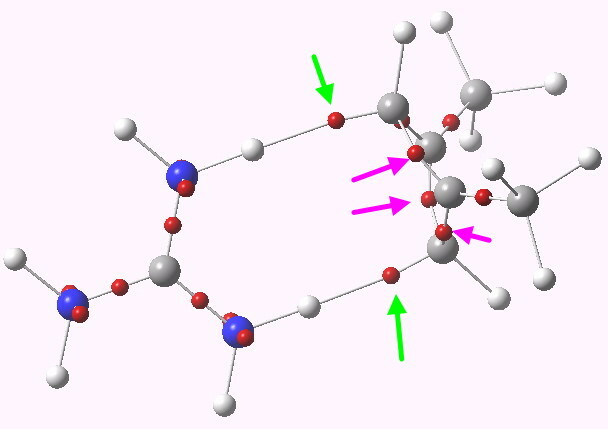 It turns out that the R form of the 1,3-dimethylcyclobutadiene is itself stabilised by hydrogen bonding to the guanidinium cation. 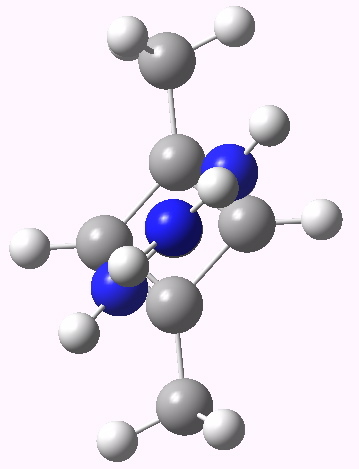 These hydrogen bonds form to the centre of the shortened C=C alkene bonds rather than being directed at an atom (π-facial bonding). In contrast, the ZW forms sustain hydrogen bonds directly to the carbons. To explore these unusual features, click on any of the three thumbnails below. Zwitterionic form. Click for 3D. Where have the electrons gone in e.g. the symmetric ZW system? An ELF analysis tells us. The two ELF basins labelled with green arrows contain 1.2 electrons each. The basins corresponding to the 4-ring are labelled with magenta arrows. Put simply, 2.4 electrons have fled the ring, and associated themselves instead with the N-H…C hydrogen bonds. By removing ~2 electrons from an anti-aromatic ring, one converts it into an aromatic one (4n => 4n+2)! We have learned that the highly reactive alkene bonds in R-distorted cyclobutadiene can be reasonable hydrogen bond donors, but that an alternative distortion into a zwitterionic form can be stabilised by forming an even stronger hydrogen bond to the forming carbanion. 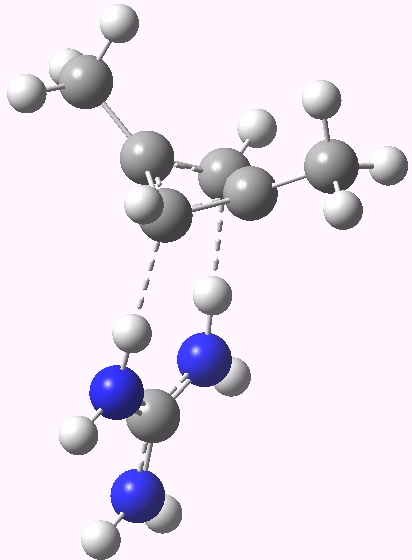 A symmetric form of this latter is unusual, since it still sustains four equal C-C bond lengths, but anti-aromaticity is now avoided by pyramidalising two of the carbons and hydrogen bonding to them both. As I noted earlier, these isomers of cyclobutadiene have not hitherto been proposed, and they do seem good candidates for experimental investigations. This entry was posted on Sunday, September 18th, 2011 at 10:09 am and is filed under Interesting chemistry. You can follow any responses to this entry through the RSS 2.0 feed. You can leave a response, or trackback from your own site.